I'm looking to build a garage workshop 6.5 x 7.5 x 3.2/4m. My slab will be 150 -200mm steel reinforced with 50mm of Celotex under it. My question is, what do I do with the DPM at the edges? Should trim it down and have a gravel moat around the building or I could bring it up the side of the slab and hold it down with the sole plate (or even up the framing and pin it under the cladding?? I was going to lay a strip of doc under the plate anyway. Thanks for your question. I have drawn up a garage foundation section (above) showing where I would put the insulation and the DPM and how the two would work together. I haven’t personally come across situations where the insulation is located beneath the slab. More often the insulation is located beneath a screed but above the slab, as I have shown. My understanding of the reason for this is that having the insulation sandwiched between two layers of concrete protects it more than having it directly in contact with the sub-soil. I have shown a masonry plinth built on a recess around the edge of the slab. This has two purposes: To lift the bottom of the timber above the external ground level and to hide the edge of the concrete raft. I would think that for a ‘floating’ screed like this you would use 75mm thick screed reinforced with polypropylene fibres or a layer of A142 steel mesh. The reason for the thickness and reinforcement is that garages and workshops often have quite high point loads. From car jacks/heavy equipment. So the reinforcement helps to distribute the loading and avoid cracking. What are you building the walls of your garage made from? 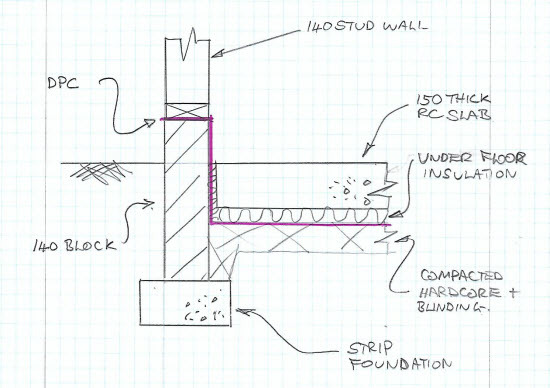 I have assumed that it would be timber but building it out of cavity masonry is also an option. I am assuming that you will be using pre-fabricated trusses for the roof as 6.5m is beyond the economic reach of most timber sections. It is also worth pointing out that your building will have a greater floor area than 30m² so as it is in the UK it will need to comply with Building Regulations. Dependent on the location it looks likely that you will also need to make a Planning Application. How does the above tie in with what you were planning. I am interested to hear and see how you are getting on. A very interesting suggestion and I'm sure it would work perfectly for most applications. However, I'm planning on installing a lift and the equipment supplier were very insistent on the concrete being 150mm minimum solid with steel reinforcement. With the insulation near the top under the screed it's likely the rag bolts simply crush it as they're 100mm long. Would I be wise omitting the insulation altogether? Would it have much effect on a slab that thick? I do also have a question on framing thickness, but we'll get to that once I've got the base design right. you're very correct about the planning and building regs. That's my next step once I've a design that's suitable and affordable. I've had quotes for both fink and raised tie trusses already. Would 4×2 c16 be strong enough at that size building or would 6x2 be a better option? I also get a lot of damp on my tools in my current garage. I'm keen to stop that by design. For my first detail you could possibly leave out the insulation locally around the holding down bolts for the equipment. It would be a cold-bridge but only locally and if internal to the building would not be subject to the same variations of temperature as an external wall. If all you are trying to do is to make a garage, but better, that would probably work. If you are trying to make something to a residential type standard then I don’t think it would be acceptable. I had another think about how this could work and sketched the following arrangement out. You would need to have a look at how this would work at the threshold at the front of the garage and how you want it to work with external levels. With regards to the garage roof trusses. 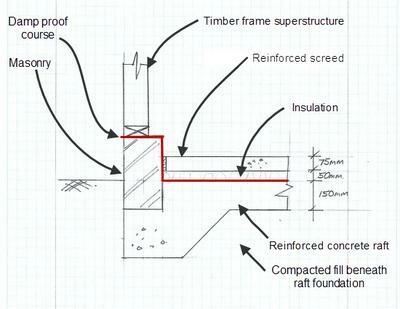 The lightest and cheapest will be standard ‘trussed rafters’ that will be made up to your span requirements. The downside of this is that the roof space will be obstructed by all of the members. A raised collar truss will give you more internal clear headroom. Which might be better for a workshop. If you wanted to use the upstairs space for storage, games room etc. then attic trusses would be the way. Attic trusses are designed so that the internal space isn’t obstructed and the bottom chord has sufficient strength to be used as a floor. When you are looking at trusses. If you are getting a specialist fabricator to make them then they should design them for you, they will have software to suit their fabrication system, to meet your requirements. If you are making your own trusses or getting a builder to make them for you then you should get a local engineer or architect involved. They will be able to give your project the attention to detail that I can’t on a simple Q&A section such as this. Would be great to hear more about the project as it develops. Are you building it yourself? Are you building it to support your hobby or extra outside storage space? Thank you for your responses. I'm getting some great ideas now. For the door threshold I could fix some 90° bent tread plate to the floor. That would cover the dpm and protect the edge of the slab. 150mm is fairly common timber size over here, I wasn't sure if 100m x 47mm would have enough strength to withstand the weather loads put on it. The trusses would be factory made although I'm keeping an eye on eBay incase a set of mis-measured trusses come up in my size. Is there any advantage to wrapping the building in breather paper before fixing the shiplap? There wouldn't be a gap behind it (although there could be if was really needed). I'm thinking of filling the frame with 100 - 150mm of loft insulation before lining with ply on the inside.